I lived in Boston in 1984. How did I manage to miss seeing this dinosaur being delivered to the Museum of Science? Thank you to Dr. Jane Winchester of Greenfield, Massachusetts, for sending the link to this photo by Arthur Pollock. I originally posted it here on February 24, 2013, to celebrate the birthday of Dr. James Deane, also of Greenfield, in 1801. Deane was a member of the Massachusetts Medical Society, as is Dr. Winchester today. She has researched Dr. Deane and written him up for his medical work as well as his activities in studying dinosaur footprints. 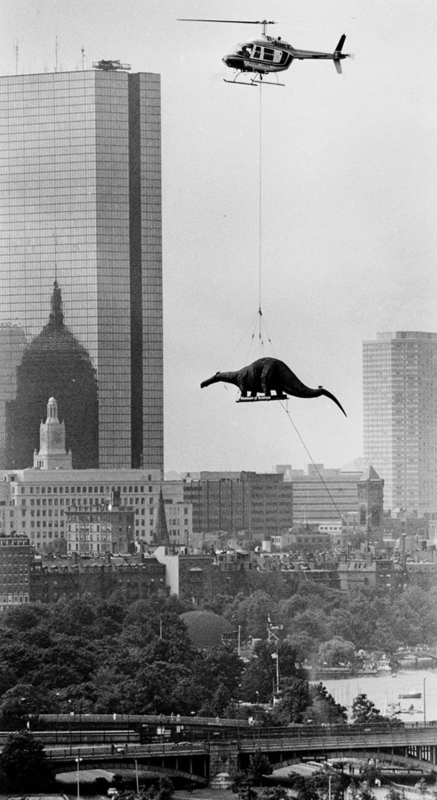 Posted in Blog, History, Science, UncategorizedTagged Boston Museum of Science, dinosaur over Boston, Dr. James Deane, flying dinosaur, Pocumtuck Valley Memorial AssociationBookmark the permalink.